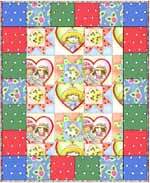 This block is a good one to use for scraps. Just keep your darks and lights alternating through the block. 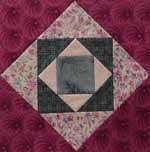 Use the center square to highlight a special focus fabric. Have fun trying different fabrics for totally different looks. A 4 Dark Cut two 4 7/8" x 4 7/8" squares. Cut in half diagonally. B 4 1st Light Cut one 5 �" x 5 �" square. Cut in half diagonally twice. 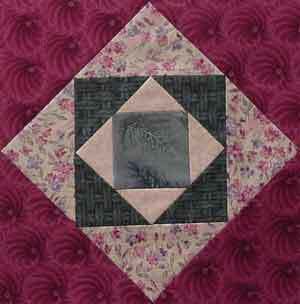 C 4 Medium/Dark Cut two 2 7/8" x 2 7/8" squares. Cut in half diagonally once. 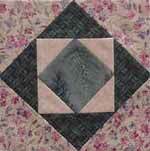 D 4 2nd Light Cut one square 3 �" x 3 �". Cut in half diagonally twice. E 1 Focus Cut one square 2 �" x 2 �". Step 1:	Sew D triangles to square E by sewing one triangle to each of the two opposite sides, then press seam open or towards the outside. 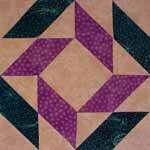 Sew the other two triangles to the other two opposite sides of square piece E. Press seams open or toward the outside. Step 2:	Sew & press C triangles to section D,E unit the same method as in Step 1. Step 3:	Sew & press B triangles to section C,D,E unit as in Step 1. Step 4:	Sew & press A triangles to section B,C,D,E unit as in Step 1.